If you have walked through the 1st Floor of Stopford House in the past 12 months you will have seen the increased population of colourful boards on display and the frequent congregation of people studiously discussing things in front of them. You may have wondered what this is all about. In today’s distracting and noisy world, it is very easy to get lost in the many and varied demands flying at us from all angles. If we are not careful these high volumes of work will keep us very busy, dizzyingly so, but it is quite a different matter to ensure we are being productive. Working visually, openly and collaboratively has been proven to deliver better outcomes, quite often by expending less effort. We create a visual representation, on a board or wall, depicting how work moves through our “system”. This system can be our direct team or a group of teams we are reliant on to get things done. Making the work visible, along with queues, blockers, bottlenecks, and ourselves can instantly show us some very interesting things about how the work gets done, or doesn’t get done. By encouraging people to limit the amount of work we agree to start, we reduce the time it takes for that work to travel through our system. Many expressions exist to describe our deeply optimistic human compulsion to say yes when it comes to accepting work; “biting off more than we can chew”, “spinning plates” and “trying to boil the ocean” are a few. Limiting WIP creates focus and discourages switching between tasks which can be highly inefficient. “Stop starting and start finishing” is a mantra often repeated with Kanban. Starting work can feel very rewarding particularly if what we were working on has been blocked by something else. Unfortunately, we derive very little if any value from part finished work so having lots of incomplete work in process only serves to keep us busy. Finishing work and handing back to the person who asked us for it creates value for them and so optimising what we do around completing and not around starting is the best way to give value and satisfaction. The first 3 steps help to identify opportunities to get better at delivering work. Instead of starting something new when work is blocked, seek to eradicate those blockages. This could mean a change of behaviour, or learning a new skill from a colleague, improving a relationship with another team to ensure easy hand offs of work or sequencing work in a different order. 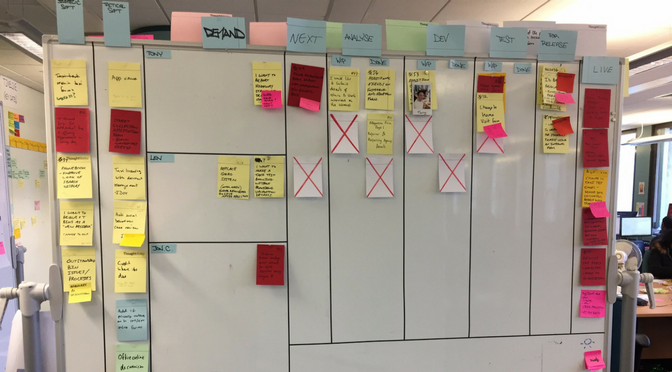 IT’s adoption of Kanban has identified a wealth of improvement opportunities and unearthed a whole bunch of constraints that we were previously unaware of. We are able to collaborate amongst ourselves and with other service teams, stakeholders and customers in a much more transparent way than we could before. The whole approach introduces and encourages us to appreciate the act of learning as we work and empowers all of us to admit where things are not working as well as we would like and therefore we change things to create an improved outcome. 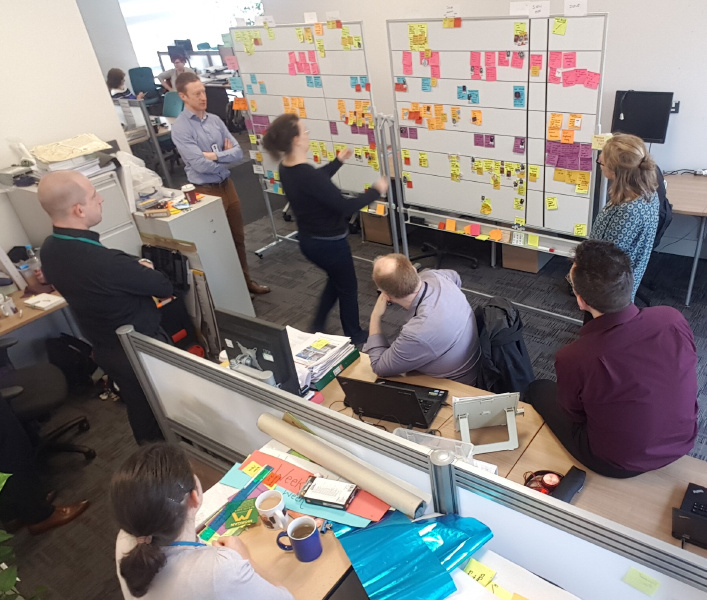 The cumulative positive effects have been noticed by many across the local authority and IT are now supporting more and more Service Areas to understand how their work translates visually and to adopt and adapt Kanban in order to identify improvement opportunities. Very interesting and helpful approach!